Haomei Al. is both a 5083 aluminum plate manufacturer and supplier with 18 years experience. So factory price is available. Besides, we use the finest raw material to improve the product quality, and we are certificated to CCS (China Classification Society) and DVN GL (Norske Veritas), guaranteeing the quality of our 5083 aluminum sheet lives to national standards. Haomei Al. can manufacture 5083 aluminum plate with many tempers, such as O, H32, H34, H112, H116, H321, etc., and it can be cut to size at customers' need. 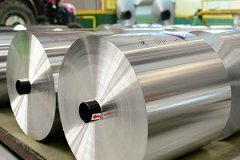 5083 aluminum sheet belongs to Al-Mg-Si aluminum alloys. Its main contents are Magnesium and Silicon except Aluminum. Over 4.0% of Magnesium enables 5083 aluminum plate to have excellent resistance to correction, and easily to welded. By adding cooper, 5083 aluminum plate has 28% Electrical conductivity. 5083 aluminum plate also has good forming characteristic for either hot or cold working. But hardening is accomplished by means of cold working only. Besides, 5083 aluminum plate does have good strength but non-heat treatable. 5083 aluminum plate has vast applications for its properties above. It is commonly used in the manufacture of marine, auto aircraft cryogenics, storage tank, railway cars, coachwork, armor plate, building construction, pressure vessels, etc.